Manage Reviews As Business Reputation Development! The term reputation management refers to a business effort to try and control what a potential customer will see when researching you. And understand this: it cannot be controlled! Those days have passed because there are literally hundreds of search & directory listings for your business with review entry, offering anyone an ability to review. However and in this day and age, we should not fear it; better yet, we should see it as reputation development opportunity! In order to thrive in an environment no business can control, it is essential to become proactive in the development of reviews that ultimately define a reputation. How does a business improve its’ online reputation? The practice ultimately consists of a well executed plan to pursue reviews; to pursue each & every HAPPY customer who might otherwise NOT think to give a review. Believe it or not, 99% of those potential positive reviews don’t happen BECAUSE the person is not in the habit AND no one ever thought to ask. Fast forward to a ‘ Reputation Development Plan ‘ in place: management has bought- in, they execute a disciplined approach to following- up with HAPPY customers for their review … and the odds of a GREAT reputation are dramatically increased. At first, it seemed like the more reviews you had the better as far as Google SERPS were concerned. And while more good reviews matter, Google’s goal when ranking a business in local search is to model the real world. In other words, the businesses that people talk about; the business they hold in high regard and patronize locally are the ones that Google wants to feature high in its’ results. And sure positive social media chatter matters, in fact it counts, but for purposes of this post we’re talking about reputation stemming from reviews. 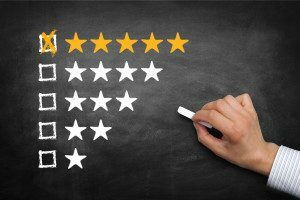 There is no longer any question: every business needs to pursue online reviews; however, the business should not only seek good, but broad acknowledgement of the specific products, services, personal care and/or even the environment that make it unique! The current online environment makes it nearly impossible for a business with poor products and/or services to hide for very long. While getting as many reviews as possible helps with search rankings, the competition is catching on. Quality is taking a front seat when it comes to both search rankings and also how people decide to patronize a business. In other words, it’s no longer enough to be high on a search results page one. A business will also need to have high quality consumer chatter. And beware – the reviews must be genuine, both people and Google’s algorithms have their ways for identifying when a review is disingenuous. People Are Changing The Way They Search For Your Business Service = SEO! As people begin to change their search habits and seek out the best comments about a business, as opposed to simply the nearest business to fit their needs, the more quality reviews must be prioritized as a marketing practice. If a competitive business in the next town over has several 4- 5 star reviews, they are much more likely to see consumers not only choose, but even drive the extra miles! And many review sites, Google obviously leading for the sheer weight of their traffic, are beginning to prioritize the quality of reviews more and more. Businesses must begin to not only think about getting those good reviews, but to ask consumers to mention why they were happy or what they liked most. The quality will speak for itself to a degree that even if the unwarranted negative review arrives, consumers will be able to make an objective decision. Consumers understand that some reviewers may be unfair. Make it easy for the reviewers pursued to give that review! Welcome honest feedback, preferably about the particulars! When soliciting reviews, don’t do it blindly > qualify the source! Summarized, make a disciplined plan for Reputation Development! Opinion: Google obviously leads for the sheer weight of their traffic, so logic would have gathering reviews on a Google listing is good practice! https://www.kineticknowledge.com/wp-content/uploads/2015/08/kinetic-knowledge-logo2.png 304 300 Kinetic Knowledge https://www.kineticknowledge.com/wp-content/uploads/2018/08/KKLogoDarker-1.png Kinetic Knowledge2017-06-21 08:00:152017-06-22 17:19:04Manage Reviews As Business Reputation Development! Is It My Website? = Is It My Digital Web Footprint? Why Does Google Want Us To Use SSL?